A few years ago I met a starving entrepreneur with great hopes and aspirations for the future. Like Jake and Elwood Blues, Rich Cohen is a man on a mission, but he needs two things… a louder voice and customers. Distant Village Packaging is “different” to say the least. This is due to Rich’s understanding of what sustainability really is, plus his generous and concerned heart. Sustainability, as Rich defines it is a three-part process which includes Environmental, Economic and Social pillars of sustainability. Unlike many concepts of sustainability today that only include the environmental aspect, Distant Village’s philosophy is different and refreshing, but more importantly it is a great model for all of us. Recently, I had the pleasure to introduce Rich’s Philippine partner to the finer, more cultured aspect of life in Nashville… Yes, I took them Honky Tonking! Arlene who lives in the Philippines and serves as the main contact for the artisans scattered in small villages and communities had never heard a Johnny Cash song, much less Elvis. I told her to be prepared for a radical experience as we entered Legions Corner on lower Broad. The events that followed (those that I remember anyway) could easily make a different blog article, but it gets me off point. Still, here is picture. Rich on left, Arlene, MarLene and Walter. 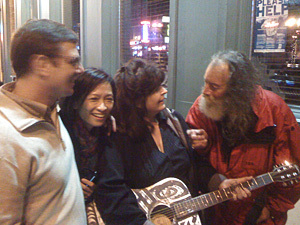 Walter was a homeless musician we met while enjoying some local culture. During dinner I asked Arlene if she is making any money with the Distant Village project. Much to my surprise in the din of downtown noise she said in her quiet voice that it wasn’t her goal to make money. “I’m doing it for the people,” she said. As Rich has told me many times, it is about bringing sustainability to the families, farmers, paper makers, artisans and all the rest. Arlene said that during the summer they had no “PO”. What she meant hit home. They did not have a purchase order from Nashville Wraps to make more Distant Village products, so the villages simply had no income. Arlene of course helped them as best she could. To Rich and Arlene it has been and always is about the people in the Philippines. We so often get caught up looking at the products and the numbers that we forget the people behind them. I did. Unlike large factories in China, there are no big factories involved in Distant Village Products. These are literally community projects that bring together families and provide hope and well being to all involved. Rich has even started a foundation to help get the children in quality local schools and improve their future. I’m going to try and wind this article up, but I did want to leave you with a couple thoughts about Distant Village products. They can make your business unique and desirable with custom hand made packaging. Whether it is a cool box made from cacao fibers, gift wrap made from mulberry leaves, or a banana paper bag with wild reed handles, it will be impressive to your customer and will set you apart. The quantities are reasonable for custom orders; they simply require some lead time. If you are just getting into organic, green or artisan products and need packaging, but don’t want it custom made, then take a look at the stock Distant Village offerings at Nashville Wraps. Not only will it create interest in what you are packaging, it will make a huge difference in the lives of the many real people behind all those products. For more about the Distant Village Philosophy and mission, visit http://www.distantvillage.com. Nashville Wraps is the leader in eco-friendly gift & gourmet packaging. Our focus since 1976 has been beautiful packaging, competitive prices, fast shipping and taking care of our customers. We listen. We care about your success. Most of all, we want to make your business look good.